Creative workspace, in-house amenities, and communal offices help attract top talent. 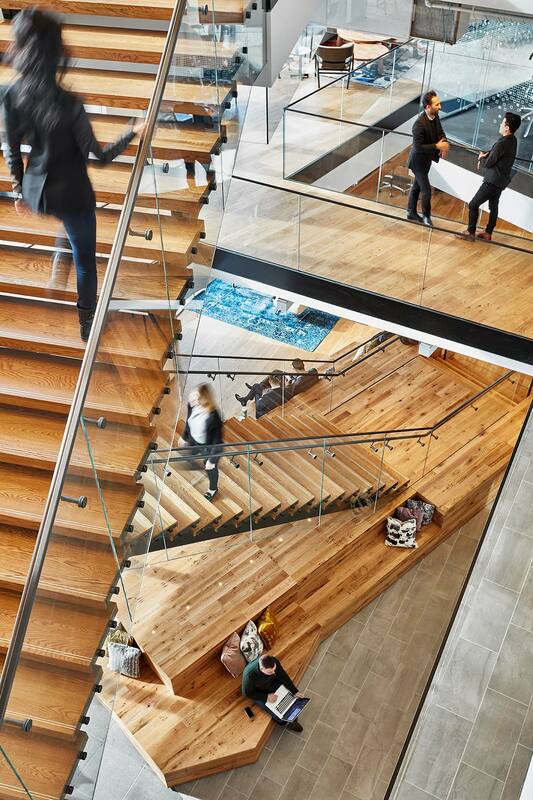 Above: At LinkedIn’s new Silicon Valley headquarters, employees are invited to join in the fun. In this era of record low unemployment, it’s no secret that competition for top talent is fierce and today’s employees tend to move on after three years on the job. Companies have countered with a slew of incentives to attract and keep good people, including better benefits and more fun office environments. But the newest office designs are pulling out all the stops — offering choices in when and where to work, placing more emphasis on purpose, providing places for social interaction, and adding interactive installations that engage their people. To attract talent, workplaces need to have a strong identity that telegraphs their mission. “The war for talent is fiercer and more competitive across a broader landscape,” says Gensler’s Amanda Carroll. “Creating distinct experiences that reflect your brand, your values, and your mission is essential.” Cultivating a sense of purpose has other benefits, as Gensler’s 2016 U.S. Workplace Survey found. The payoff: employees at the top innovative companies report more meaning and purpose in their work. A test bed for new thinking about the guest experience. Grounding employees in mission and purpose drove the design for the new Hyatt Global Headquarters in downtown Chicago, which houses the iconic hospitality company’s strategic leadership, marketing, tech, and support teams. “The big ‘aha moment’ was, let’s not think of this simply as a place to work,” says Gensler’s Randy Howder. “Instead, let’s think of it as a test bed for how we conceive of the guest experience.” From the moment an employee steps into Hyatt’s wood- and terrazzo-accented lobby, the space projects tactile comfort. Food and beverage is a big emphasis, as are casual social spaces. More importantly, the headquarters is designed to spur new ways of thinking about hospitality. The workplace is increasingly diverse, and those differences in people create a demand for spaces that are curated around variety, accommodating different ways of working. This is leading companies to seek alternative solutions from outside the boundaries of workplace design. They are looking to universities and research labs to cultivate innovation. Or they emulate hospitality or residential models to foster collaboration, connectivity, and a culture of transparency. 62% of workers do not have workplaces that prioritize both individual and group work. As new workers transition from universities, the digital learning styles they’ve become accustomed to in high school and college breed expectations for the workplace. “Students no longer have to go to the library to work. They don’t have to sit at the same desk. So when they enter the workforce, they wonder, ‘Why am I suddenly tethered to a desk?’” says Gensler’s Janet Pogue McLaurin. Gensler has studied the workplace and how it has changed since 2005. The firm is looking to map the changes and understand the new needs of today’s workers. Using data analytics, the survey has captured the responses of thousands of employees around the world, gauging the role design plays in performance and innovation. The statistical link between workplace choice and innovation is striking. In the US, for example, employees at the most innovative companies report two times more choice in when and where to work. With a team of management consultants who spent most of their time out of the office, Boston Consulting Group (BCG) built new offices in New York aimed at drawing people back in. Now, in its more communal workplace, colleagues can order a coffee from the barista at the central cafe or pause to chat on a staircase placed strategically in the heart of the space. Now, Love says, people are spending from one to three more days per week at the office. Job offer acceptances have doubled too. Successful workplaces provide amenities as important differentiators in the battle for talent. 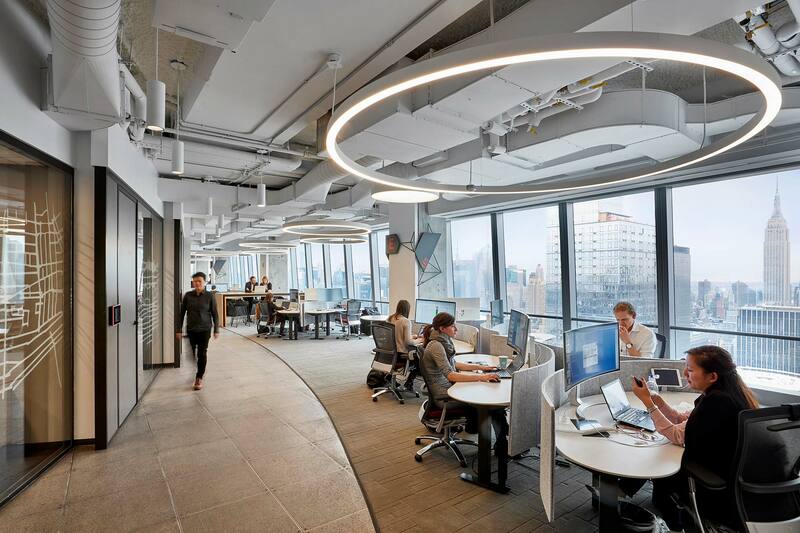 At Hudson River Trading (HRT) in New York, for example, Gensler complemented the mixture of quiet phone rooms, workstations, and breakout meeting spots with casual spaces like a game room and roof terrace — the largest terrace in the World Trade Center complex. Just as high-frequency trading has transformed the way trades are conducted, the new methodology has also spawned a new trader profile made up of mathematicians and engineers. For companies like HRT, where most of the work happens in digital space, such amenities nurture a sense of connection. “Making the space feel inviting and almost familial is a predominant theme we hear from clients,” says Carroll. 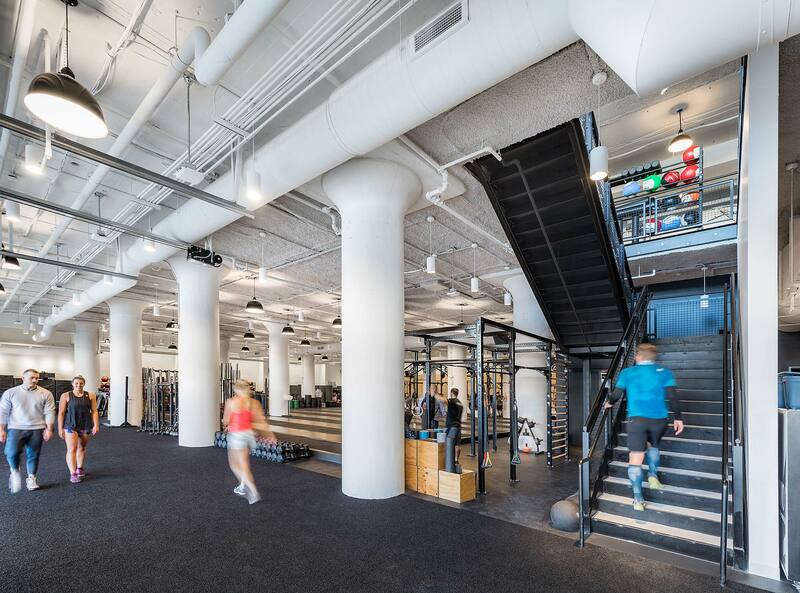 A 30,000-square-foot flagship gym energizes Reebok’s active workforce and embodies the brand. In relocating its headquarters to a renovated warehouse in Boston’s Seaport District, Reebok saw the opportunity to up its game in terms of talent recruitment and retention, while also boosting its innovation and maker culture. With space on five floors in the Innovation and Design Building, Reebok’s team feeds off the energy of startups, skilled makers, and entrepreneurs who are part of the city’s innovation economy. High-profile amenities speak to its goal to be the fittest workplace in the nation. Transparent garage doors at street level showcase Reebok employees working out in the two-story fitness center, which operates six days a week. It’s a picture of brand in motion. A wide range of wellness programs — including boxing, spinning, yoga, and acupuncture — reinforces the company ethos that fitness can change lives. After their workouts, team members can gather at the Work Cafe, soaking up the harbor views and enjoying a healthy grab-and-go lunch. Despite a lengthier commute for many, Reebok's talent retention and attraction rates are at record highs. Moments worth sharing on social media are woven into LinkedIn’s Silicon Valley headquarters. Companies with creative cultures also look to design to get their inventive juices flowing. At LinkedIn’s new Silicon Valley headquarters, bold environmental graphics invite employees to participate in the fun. 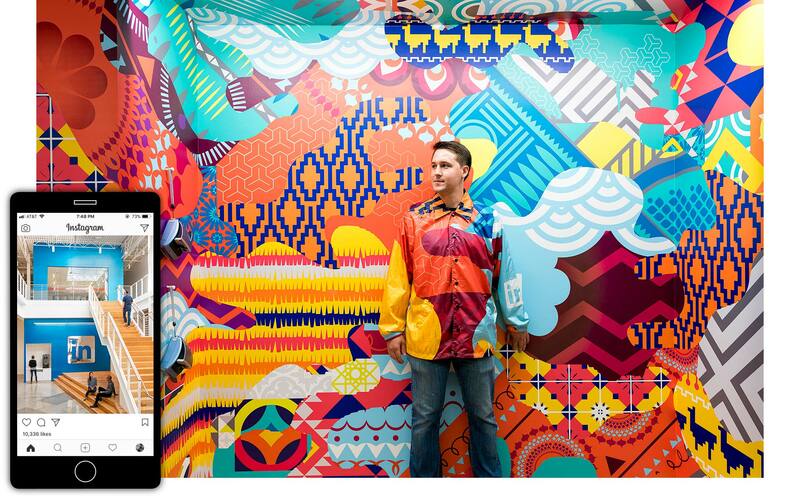 One vibrant mural is accompanied by a matching technicolor jacket that passersby can wear to take a selfie. “The idea was to provide moments when employees can take an Instagrammable photo and share it with team members around the world,” says Gensler’s Jennifer Gebhardt. Employees and visitors leave their shoes at the door of Gusto’s new headquarters in San Francisco. Based on a tradition that began when everyone worked at the company founder’s home, the “no shoes” policy helps cultivate a casual work environment for the payroll, benefits, and HR technology startup. It’s designed “to feel like a home, to be comfortable and authentic,” says CEO and Co-Founder Josh Reeves. 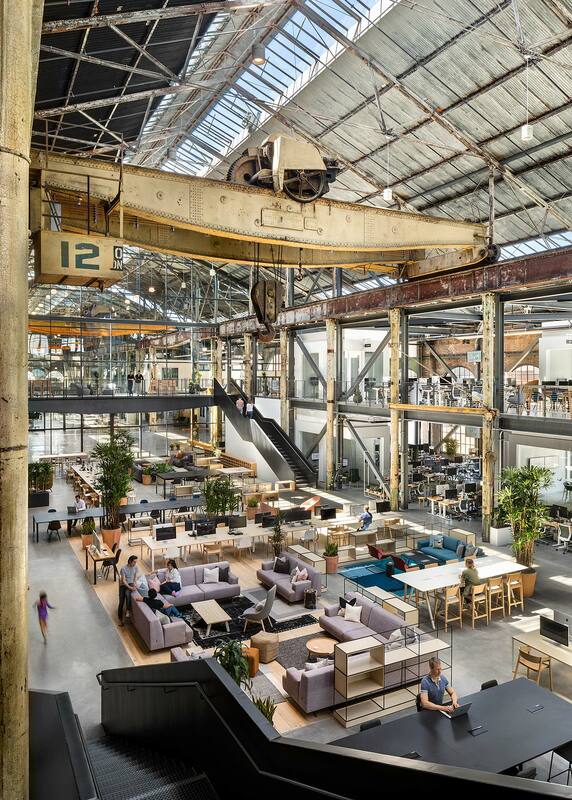 A former machine shop in San Francisco provides a creative workplace for Gusto. Even the central workspace has the feel of a living room, with a cozy arrangement of couches and chairs interspersed among the desks and workbenches. Today, giant gantry cranes recall the building’s past as a machine shop, but Gensler adapted the space to office use with perimeter mezzanines — adding new meeting rooms that preserve views to the outdoors and highlighting the historic brick walls while also absorbing sound. Ultimately, across many industries, companies are adapting to the changing nature of work by refocusing on a workplace that offers balance, variety, and a sense of purpose. Those characteristics are key to creating a workplace that puts people’s needs at the forefront. And that, in the end, is what will help companies win the high-stakes war for talent.